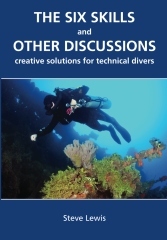 This book is not exactly a textbook or a manual giving divers D-I-Y advice on the specifics of technical diving, but it is essential reading for anyone wanting to venture beyond weekend-warrior status. While the six skills include some hard and fast physical guidelines, this book's focus is on the things other diving texts leave out. Perfect reading material for any level of scuba diver: even those "not interested" in going tech.